Fiat outsells MINI again, but can Fiat meet their sales goals? Fiat 500 sales results for September are in and once again Fiat has outsold the MINI Cooper Hardtop and Convertible. 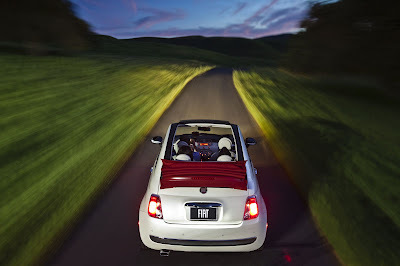 Fiat sold 2,773 cars last month compared to 2,331 MINI Cooper Hardtops and Convertibles. Additionally, this is the third month in a row that Fiat has outsold its MINI rivals. What makes this even more impressive is that these figures where achieved despite the delays getting Fiat Studios open and the national advertising campaign beginning in August and not March or April. Although this is a good performance, Fiat 500 sales did take a dip last month and may fall below initial first year sales estimates. Fiat's initially estimated Fiat 500 sales at approximately 50,000 units this first year. The plans called for the majority of the initial 130 Fiat dealerships (called Studios) to be open by the 28 of February with a full scale advertising campaign to begin in a March/April time frame. However, building the dealer network and infrastructure have gone much slower than first anticipated. The video from "Life is Best When Driven" marketing campaign never aired on TV. Fiat is brutally aware that building a building a first class dealer network is vital to counter the last time they were here in the country, so everything from facilities to the customers buying experience has been carefully crafted to ensure the highest standards. Building this organization from the ground up has resulted in delaying advertising until a "critical mass of dealerships" were available to support traffic from a full blown advertising campaign. Many thousands of people experienced the Fiat 500 in Time Square back in August. Feedback from the event was overwelmingly positive. It has taken until August to get to that "critical mass" of 100 open dealerships, and since then, Fiat has ramped up its conventional and experiential advertising. 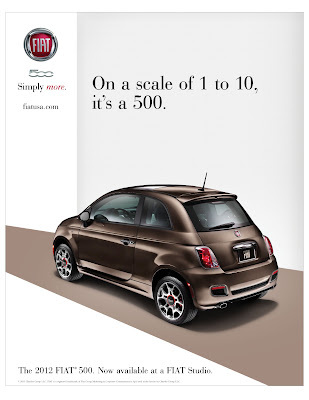 In August, the "Simply More" campaign debuted with a television ad and hands on events throughout the country where the public could experience Fiat 500 models in person. These events were well attended and received. Fiat switched advertising agencies during the month. Midway through September brought us the Jennifer Lopez collaboration and new experiential events with test drives at local shopping malls in 20 cities throughout the country. To date, there have been 13,861 Fiat 500 sedans and convertible sold in the US since the beginning of sales during Mid-March. Obviously these delays have impacted sales. There is hope that a new marketing campaign will close the gap between projected and actual sales. Full length Jennifer Lopez "Papi" video. Olivier Francoise, Global Head of the Fiat brand and Chief Executive in charge of marketing said, "it is not a problem with the car, it is an awareness problem". What better way to build awareness than with an ad that gets attention. There can be no doubt that the new Jennifer Lopez / Fiat 500 commercial is getting a lot of press these days. The ad, which is a 30-second trailer from Lopez's "Papi" music video, has become quite controversial because it mostly shows Jennifer Lopez and very little of the Fiat 500. Additionally, the current US Fiat owner demographic has been vocal in questioning the choice of Lopez, particularly on Fiat USA's Facebook Page. Mix this with the fact that Fiat USA has changed their advertising agency, and delayed openings of dealers have impacted sales, and you have the making of a feeding frenzy for the critics in the media and the public. The Fiat 500 has been sold in the US for the past 6 months, the initial buyers have been those who, for the most part, have known and been waiting for Fiat to come back into the US market, obviously Fiat needs to broaden its appeal and introduce itself to a whole new cross section of people in this country who have no idea what a Fiat is. This is where Lopez comes in, because whether you like her or not, it cannot be denied Lopez brings a shinning, super star light onto the 500, and this attention has translated into interest on the car. As of today, the Jennifer Lopez's "Papi" music video currently has had more than 14 million views on Youtube. All this attention is working. According to Edmunds.com, analysis of their web traffic indicates that interest in Fiat has increased 31 percent since the Lopez / Fiat ad debuted on September 12 during ESPN’s Monday Night Football. And if there is any question of timing the ad placement during a football game, the largest spike in traffic to Edmunds came on September 18, when the ad was played throughout the day during NFL telecasts. Inquires on the Fiat 500 were up 95 percent. This blog that you are on has also seen an enormous increase in traffic. Being listed on the first page of Google, Fiat500USA.com enjoys a healthy traffic stream, but on the day the ad aired, traffic here went up 200 percent and on September 18, went up 180 percent. Indeed traffic to this site, which averages 10 - 20 percent growth every month since Jan 2009, has spiked at a 45 percent increase over the last month. If all this attention translates to sales awaits to be seen, but Lisa Copeland, General Manager of Fiat of Austin, the number one Fiat dealer in Texas and number two Fiat dealer in the nation, has seen a positive impact of the Lopez ad. October is scheduled to bring another ad with Jennifer Lopez, and we'll have a better picture of if the advertising campaign with Lopez is working.